(January 25, 2011 - Toronto, ON - For Immediate Release) - This week, the United Nations General Assembly is officially launching International Year of Forests - 2011, and LEAF (Local Enhancement and Appreciation of Forests) is offering residents of Toronto and York Region a way to get the most out of the year by giving back to their region's largest natural resource. The declaration is designed to raise awareness of the importance of sustainable management, conservation and sustainable development of all types of forests, including those found in urban areas. LEAF (www.yourleaf.org ), a not-for-profit organization dedicated to the protection and improvement of the urban forest, runs several programs that have helped plant over 16,000 trees and shrubs and train hundreds of people in stewardship over the past 15 years. 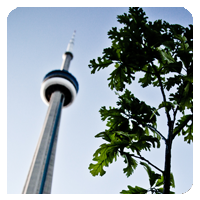 "Through our Backyard Tree Planting Program citizens are able to beautify their homes, cut down on energy costs, and help Toronto and York Region’s tree canopy grow," says Janet McKay, Executive Director, LEAF. "Our subsidized program, which includes a consultation with a certified arborist, offers 25 species of native trees and 26 species of native shrubs. It focuses on getting the right tree in the right place to ensure the longevity of Toronto and York Region's urban forest,"McKay continues. Urban forests are a source of food, shade, and privacy, forming an often undervalued part of urban infrastructure. They also offer other important environmental benefits such as filtering storm water runoff and mitigating CO2 emissions. As the UN raises awareness that forests are vital to the survival and well being of people everywhere, LEAF is working to highlight the importance of our local urban forest. "We are excited to offer many opportunities for citizens of Toronto and York Region to get involved and truly make a difference," says Amanda Gomm, Manager, Volunteer and Community Outreach. "Our extensive volunteer program provides a wide variety of activities ranging from research to community action and stewardship." For those looking to get their hands dirty, LEAF also offers a 15 hour Tree Tenders Volunteer Training Program, aimed at individuals age 18 or older who want to gain tree-related knowledge and skills. Topics covered in the course range from tree biology, to proper planting and care methods as well as municipal bylaws and policies. Each session wraps with a group tree planting putting theoretical skills into practice while fostering a strong sense of community. "LEAF will be celebrating the International Year of Forests throughout 2011, and I encourage all residents of Toronto and York Region to get involved in any way they can," says McKay. LEAF’s Backyard Tree Planting Program is supported by Ontario Power Generation, Ontario Power Authority, York Region, Town of Markham Trees for Tomorrow Fund, Live Green Toronto and Toronto Hydro Corporation. LEAF’s Tree Tenders Volunteer Training Program is supported by Ontario Power Generation, Sobey's Earth Day Canada Community Environment Fund, the Canadian TREE Fund, the Toronto Transit Commission and the Helen McCrae Peacock Foundation through the Toronto Community Foundation. LEAF’s Volunteer Program is supported by the Ontario Trillium Foundation.